Colborne was the only NHL-ready centre prospect in the Leafs system with a non-zero chance of becoming a top-6 player. The Leafs, however, weren't willing to wait for Colborne to develop into that player and weren't prepared to give him fourth line minutes over Colton Orr and Frazer McLaren in the meantime. So rather than send him to the AHL and lose him for nothing on waivers, Dave Nonis dealt him for something. Dealing Colborne isn't as bad as Brian Burke dumping Jiri Tlusty or Pat Quinn waiving Steve Sullivan. To be fair, at 23, the clock was certainly running out on Colborne's prospect status, and his likelihood of becoming a top-6 player was diminishing (his list of comparable players doesn't include a lot of talent). But Colborne had a chance. In four AHL seasons Colborne only managed 125 points in 211 games, a disappointing total for someone considered one of a team's better prospects. However, Colborne seemed to turn a corner in his development at the beginning of 2011, leading the AHL in scoring for a few months before injuring his wrist. 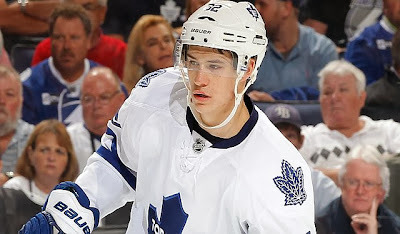 Colborne tried to play through torn ligaments in his left wrist, and eventually broke the wrist and needed surgery. Colborne admitted playing through the injury was a mistake because his injury-caused ineffectiveness crushed his confidence. After a slow start to 2012-13, Colborne played at almost a point-per-game level from January on. And after a late-season call-up to the Leafs, Colborne looked serviceable in the playoffs. After Game 1, Frazer McLaren didn't even dress in the playoffs. And more broadly, there is no chance either Orr or McLaren will be anything more than a five-minute-a-night player. The deal represents the organizational philosophy in Toronto: pure brawn over even a modicum of skill. If Randy Carlyle is going to have a line play five minutes a night, he wants to fill it with guys who punch faces, not guys who can create a pinch of offense. In other years the Leafs might have kept Colborne as an extra forward, insurance in case Tyler Bozak, Nazem Kadri, or Dave Bolland go down with an injury. But the Maple Leafs are in a cap crunch. After blowing through cap space this summer, the Leafs sat over the salary cap and needed to make moves to get in under the cap. Rather than loan Orr to the Marlies until David Clarkson's suspension ends, or place Frazer McLaren on long-term injury reserve, the Leafs chose to deal Colborne, even though he's making only $50,000 more than the minimum salary. A chance exists Orr would have been picked up on waivers, but he cleared waivers in 2012 and there aren't many teams willing to pick up a face-puncher with a multi-year deal making nearly double the minimum salary. And if a second enforcer was so desperately needed, replacing McLaren for 10 games with a cheaper option like David Broll could save the Leafs precious cap space. Instead, Colborne is the one who feels the pinch. He's a casualty because he doesn't fit the fourth line in Toronto. He isn't overly physical, he doesn't fight, and he might be something more than a career fourth liner.